Peeking at the success of Rovio’s Angry Birds is one good indication where the mobile app business is heading this year, and taking into account the proliferation of smartphones, it ultimately signals one boom in the apps market this year. According to HIS iSuppli, they released a report today saying that we’ll be seeing the mobile apps business raking in approximately $3.8 billion in revenue by the end of this year. 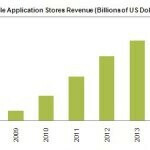 The figure takes into account that the app stores owned by companies like RIM, Nokia, Google, and Apple, will grow by 77.7 percent this year alone. Looking towards the future, the business is surely to trend upwards since it’s projected to eventually hit the $8.3 billion mark by 2014. 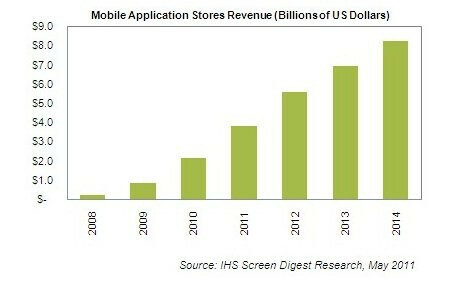 Without a doubt, it goes to show that there is plenty of business sprawling in the mobile apps market, especially when the total combined revenues from app stores tallied in at $2.1 billion in 2010, which is double the 2009 figure of $820.6 million. HIS mobile analyst Jack Kent stated in a statement, "With consumers continuing to show robust, unflagging interest in downloading games and other applications to devices like smart phones and tablets, collective revenues from the four stores will climb sharply this year." We’ve seen some huge hits with certain apps, but it’ll be interesting to see what other ones will be able to replicate the success of some of the industry’s top hits – like Angry Birds for example.